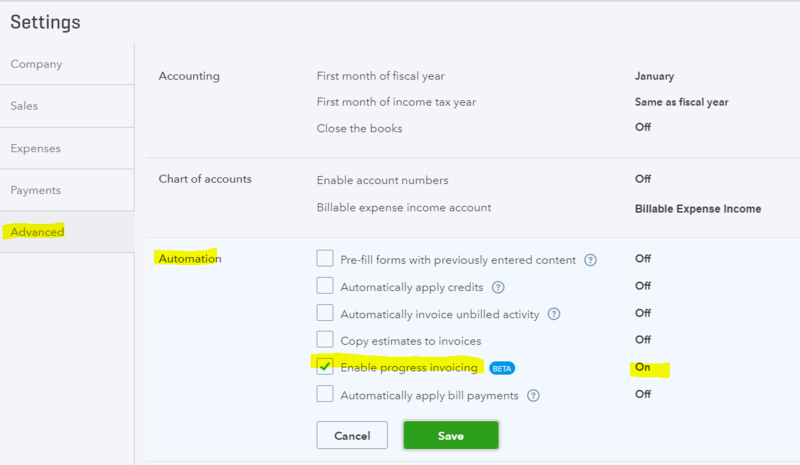 QuickBooks Online is introducing Progress Invoicing which is still in “beta test” mode as of writing this blog article in February 2018. That means there could still be significant changes until they wrap up the beta test. Progress Invoicing feature allows you to invoicing a client incrementally for the percentage (or fixed dollar amount) that has been completed of the work due or agreed upon the contract. This could be considered a type of partial invoicing or a type of installment invoicing to your clients. This is a welcome addition to QuickBooks Online since this is ranked #2 feature request on QuickBooks feedback page. This will also enable different settings such as “Convert Estimate to Invoice”. QuickBooks Online – Anytime, Anywhere. Easily Track Sales, Bills and Expenses. They offere three plans – Plus $50 per month, Essentials $35 per month and Simple Start $15 per month. See which plan is right for you. BUY NOW or Try it FREE for 30 Days! a) Entire amount: all the lines are invoiced at 100% of the Estimate. Save the Invoice. Now on your Estimate, you can see the Amount Invoiced and Amount Remaining. Remaining is based on the amount invoiced per line. 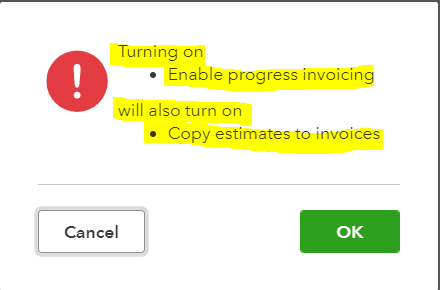 To delete a line on a Progress Invoice, click on the trashcan on the right side of the line, and choose Remove Line (do not choose to unlink it). This removes the line from the Invoice and puts the amount back on the Estimate. 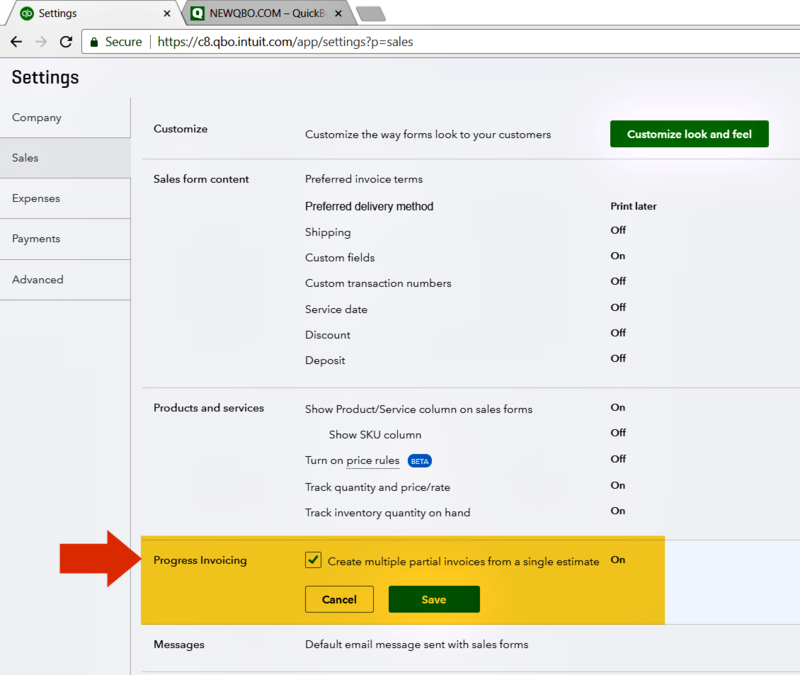 The “due” column and Estimate/Invoice Summary will not show on the printed Progress Invoice at this time, but the invoice for your Customer will have all the calculations for progress invoicing. If you like to see improved customize data layout (like added new columns) that you see on Invoice form and Estimate form, send them your feedback request, click here. On each line on the right-hand side, there will be links. The remaining amount does not include tax, discount or shipping. It only includes the line item amounts from the Estimate minus what has been invoiced for that line. Can I invoice for an amount greater than the estimate? If the estimate line is open, then you can invoice for an amount greater than the estimate. Once the line on the estimate has been completely invoiced, it will not show as available to invoice. If you want to change or add component items to Bundles, go back to the Estimate, and add it there. How to enter prepayment to the vendor supplier. How do I match vendor bill received later?